This is the second post in my Creative Disruption trilogy. The first one provided strategies to protect your company from disruption. In this one, I would like to focus on the obstacles that companies need to overcome if their product or business is likely to disrupt the marketplace. Companies such as Uber, Airbnb, Tesla, and Amazon have had to overcome a sufficient number of these obstacles to put their companies on the path to success. Perhaps they could have had smoother sailing or greater success quicker if they had anticipated some of these obstacles and developed strategies to overcome them. Overcoming them will be the subject of my third post in this trilogy. 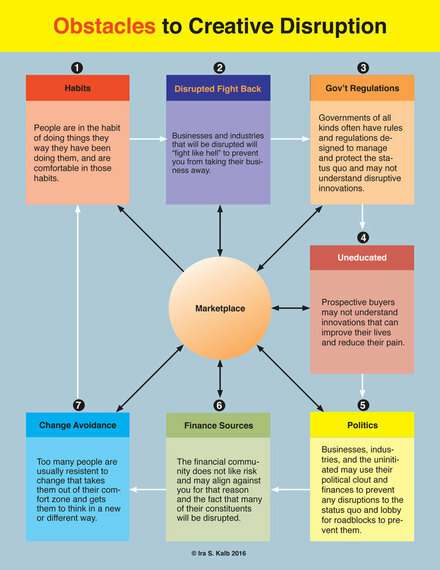 For now, lets look at the obstacles you are likely to face if you disrupt the marketplace. From a marketing viewpoint, habits are perhaps the biggest obstacle for a disruptive technology, company or product to overcome. Why? Habits are ingrained in the brain. They are similar to "grooves" that humans fall back into even when they try to break habits such as changing eating patterns to lose weight. The human brain is designed to protect us from harm. Habits are shortcuts our brains take (with less conscious thought) so we can be available for emergencies and more important things that come along. People try products. If they work sufficiently well, there is no compelling reason to seek alternatives. In fact, it takes conscious work and effort to change habits. Since people are busy or lazy, they fall into these habits. They say that to avoid arguments, you should avoid discussing religion and politics. One reason is they tend to be deeply-ingrained in the belief system of the human brain, and people get very emotional when a company does or says something that goes against their belief system. Branding is a powerful marketing tool that companies employ to get buyers to select their products without much conscious thought. The stronger the brand relationship, the more difficult it will be for another brand to break that habit. Companies and people that work for them will see their livelihoods threatened when a disruptive product or technology comes along to threaten their continued success. They will "fight like hell" to extinguish the threat - making it all the more difficult for the disruptive force to succeed. People have different views about government regulations - depending on whether they perceive them to be a protective or threatening. Speed limits are set to protect lives. Those in a hurry drive over the speed limit, and believe speed limits are for the other drivers that do not drive as well. Companies that are regulated do not like regulations because they tend to slow down product development and raise costs. A new drug may take 7 to 10 long years for FDA approval even if it could save lives. The reason for these regulations is some drugs that were sold, such as Thalidomide, caused birth defects and other serious health problems. When that happens, victims sue the companies and the Government. To protect health and avoid lawsuits, the Government takes its time to reduce the risk to the public of new products that could cause harm and trigger litigation. After all, when the Government pays, taxpayers foot the bill. Disruptive products and technologies have capabilities that are often unknown to buyers. For buyers to desire these products, they need to first be educated as to what they are and what they can do for them. This takes time. Marketing strategies can shorten the time, but they have to be sufficiently good to be effective. "Because the purpose of business is to create a customer, the business enterprise has two-and only two-basic functions: marketing and innovation. Marketing and innovation produce results; all the rest are costs. Marketing is the distinguishing, unique function of the business." While related to Government regulations, politics is much broader and a huge obstacle to disruption. People that feel their companies and jobs will be threatened by disruption will exert their political power to try to stop the disruptive companies and products. Ever since they started, Uber and Airbnb have been under attack by the disrupted for all sorts of reasons. Tesla and Solar City have targets on their backs because they disrupt the automotive and energy industries as they are presently constituted. On the one hand, smart and confident finance people know that the risks are proportional to the gains. The bigger the risk, the bigger the potential gain. However, because of their responsibilities to their constituents (that naively want upside gain without downside risk) most financing sources tend be risk averse. They think the bigger the risk, the bigger the potential losses. To get financing in early stages, therefore, disruptive companies have to use their own funds, get financing from friends and family, or find angel investors online and off. Since money is the mother's milk of business, this can be a huge obstacle to disruption. While somewhat related to habits, change avoidance is broader. The primitive part of the human brain that seeks to protect us will resist change. There is a great fear of the unknown since the vast majority of people only seek change if they are sufficiently uncomfortable with the status quo or brilliant marketing forces effectively communicate the benefits of change. Because of the obstacles above, and others I did not cover, disruption may sound great to inventors, but is rarely easy. To help insure the success of any disruption, step one is to be aware of the obstacles. The worst thing a new business can do is to be unaware. Once the obstacles and pitfalls are identified the next step is to develop strategies to overcome them. That is the subject of my next post in this trilogy.